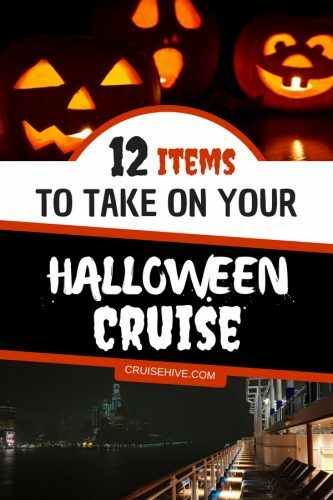 If you have a Halloween cruise coming up then here are 12 items you can take to make sure you have the scariest cruise vacation ever! Halloween is one of the most popular days of the year and the scariest! Even cruise lines put on special activities and events throughout the voyage. 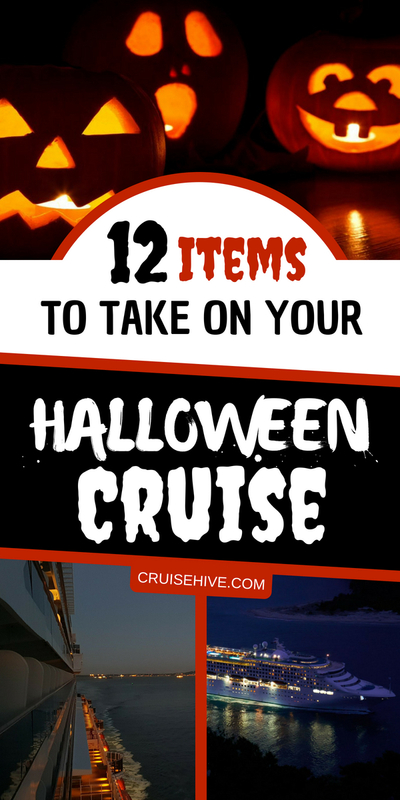 What we’ve done is put together a list of items which can actually be taken on your Halloween cruise vacation and used onboard. Some are good for general travel and some or good for those evenings at the cruise ship bars and parties. Disclaimer: Just to let you know that by purchasing from any of the links below would earn us a commission. We’ve searched through a lot and only chosen the items which will be for the cruise. We kept away from things which needed to be plugged in or could damage the cabin. You won’t find any Halloween stickers here but feel free to head over to Amazon for all things scary! This one was difficult to choose because there were just so many to choose from. What we liked about this luggage tag is the bright red text and how much it stands out. We want to make sure everyone sees it during your embarkation day! The store also features a wide range of other Halloween luggage tags which you might like more. Take a look here. A cruise vacation isn’t just about what happens onboard. A lot of the experience can be in port so what’s better than showing off your Halloween beach bag. This bag can be used to keep all your port of call accessories. Find out more here. These Trick or Treat totes are so good for the kids during the cruise. Often cruise lines will put on activities for the kids and these small totes can be used to collect those very important candies! They are small so can’t really be used for anything else which can be a problem. The good thing is that the Halloween totes can be easily cleaned and used each year. Get yours here. Door hangers are a big thing on cruise ships so how about a Halloween “Boo” door hanger? It’s skinny so will fit well on the cabin door. All your fellow passengers walking past will know you’re in the Halloween mood! Do check with the stateroom steward first before putting this on the outside cabin handle. This door hanger is also recommended by Amazon, Check it here. We’ve continued with cabin door hangers with these Halloween themed ones. They look really good and with the use of ribbons can easily be put in other areas too. These ones on this list are suggested by Amazon and the store has even more to choose from so worth taking a look. The details are here. It’s always nice to have a themed passport holder and this one is worth taking for your Halloween cruise. It’s fairly simple and is a nice design which can be used each year during the Halloween season. Not just for cruising but use the holder for general travel too. Get yours here. Wearing a lanyard during the cruise is a hugely popular thing so you really need to get a Halloween pumpkin one. You can only get the cruise line logo one onboard so get in the scary mood by proudly wearing this. You will need a hole punched in your room key card and this can usually be done at guest services. This lanyard has a 5-star rating and suggested by Amazon. Take a look here. A similar Halloween lanyard to the previous one but with a different design. We chose this because of the faces, they are creepy and funny! Perfect to wear around the ship but be prepared for many cruisers asking where you got it from. Buy it right here. It’s time to start thinking about Halloween at night during the cruise. Many cruise lines will put on deck parties and events which are perfect opportunities to really show off your scary moves! As soon as we saw this, we just had to include it on the list. The Skeleton gloves will light up and look really good at night. Good for showing off during a Halloween party or even when at the onboard club. It has a flashing mode and different colors, all powered by batteries which can easily be purchased on the ship. There are sizes for kids and adults. Amazon also recommends this which means it’s gotta be good. Take a look here. Now comes one of our favorites! This isn’t just your regular Halloween mask, why not be extra scary during the cruise with this battery-powered Jigsaw Puppet Mask. It has slow blinks and fast blink options and is great for Halloween themed parties not just on the ship but on land too. We would just say to make sure it is protected when packing for your vacation. More details are here. These are light up Jack-o’-Lanterns which can be used for your Halloween voyage. They are battery powered so no issues taking onboard. Can be used for the kids during trick or treat activities and can even deck out the cabin with them. You will need to allow some space in your luggage for these but maybe you can just take the smaller ones. Find out more here. We’ve saved the best for last! Not fully Halloween themed but what’s scarier than seeing someone walk around the ship with poop on their head. It’s in the shape of a wizard’s hat and reminds of that Harry Potter sorting hat. The emoji poop can be easily packed away and the first choice by Amazon. You know you want this! Get it right here. We want you to enjoy your Halloween cruise and we hope some of these items will make sure you have a memorable time. We could feature a lot more but if we did that would be here all week! Just remember to always check with the cruise line first before taking anything on the ship and do read the full details before purchasing.